We can apply this concept of a value map to ascribe the relative value positions of competing products. For instance, if you mapped the value of a BMW 750i versus a Toyota camry, the former would have higher marks. A common way to display this data is then to compare the total value of different products relative to price. Using this methodology, you can compare the relative price/value of different products in the market. Value also can shift for a product over time. A 1985 Toyota Camry would have lower value than a 2008 Toyota Camry, for example. To show this graphically, we would swap price in this graphic with time. Or to make it easier to see, you would put time on the horizontal axis and value on the vertical axis, like so. 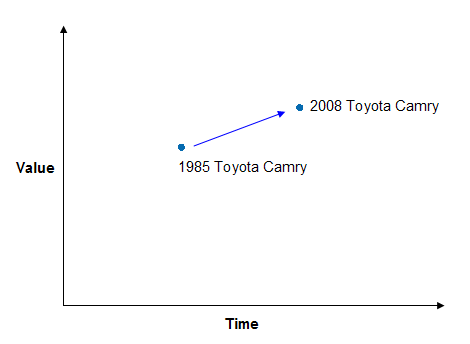 The 2008 Toyota Camry delivered more value to the consumer than the 1985 model. This is a useful tool in a variety of business and market situations. In particular I'm interested in how it applies to the US auto market, the topic of a subsequent post.